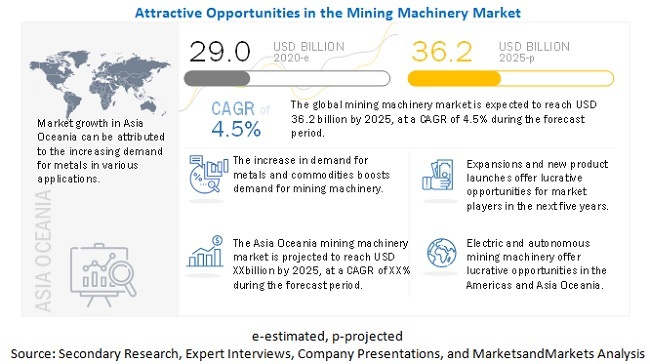 [185 Pages Report] The mining equipment market is estimated to be USD 77.7 billion in 2018 and is projected to reach USD 112.3 billion by 2025, at a CAGR of 5.40%. Increase in demand for metals and minerals, upcoming emission regulations, increase in development of electric and autonomous mining are the major reasons for the market growth. Crushing and pulverizing equipment are used to break down larger materials into smaller pieces. Crushing equipment is generally a part of the material handling equipment or plants. This equipment applies pressure to the material that is fed into it to break it down into smaller pieces. Crushers are generally stationary equipment that are heavy and built into a plant. The various types of crushers are cone crushers, jaw crushers, split feed crushers, glass crushers, gyratory crushers, and stone crushers. The screening equipment is used to separate one material from another. As these equipment are the most essentials ones, they are readily used in the mines. They are used in open and closed mining pits. Hence, it accounts to have a major share in the overall mining equipment market. During the forecast period, Asia Oceania is the largest market for screening equipment due to large-scale mining in China and India. The key players operating in the mining industry are transforming the equipment toward automation along with the electrification trend. The autonomous mining equipment are tested since 2008 by players such as Komatsu and Caterpillar in sites such as Gabriela Mistral and Solomon. With decreased exhaust emission limits, globally, the manufacturers are facing a tight operating issue reaching an optimum balance between the output received, cost incurred, and profit margins by adhering to the government regulations/norms. As the mining equipment industry is directly affected by the demand and pricing of the mining products, the margins with the operators are quite low. Hence, if the efficiency of the equipment is increased, it will improve the profitability of the business. OEMs such as Komatsu and Caterpillar are offering the retrofit option on the existing fleet. As the mining equipment performs 24X7, which is a higher number of working hours, there is a continuous demand for these equipment. 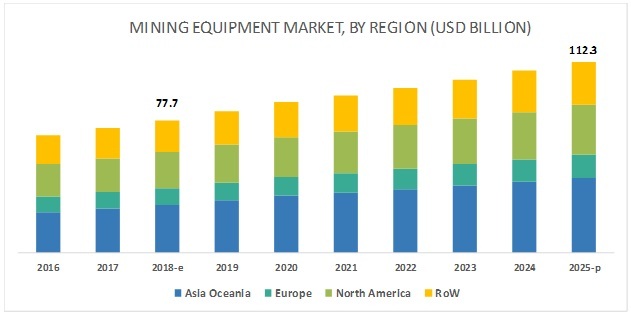 During the forecast period, the surface mining equipment accounts to have the fastest growth because of its widespread operation, equipment offerings, and ease of autonomous adoption in the equipment type. The mining equipment industry has witnessed substantial growth, particularly in emerging economies such as China and India. Asia Oceania is expected to witness an annual growth of 6-7%, whereas the overall global growth rate is expected to be 5-6% during the next 8 years. The region has witnessed growth in mining operations due to increasing demand for raw materials. Also, many international companies have increased their presence in this region. For instance, Vale, the world’s largest iron ore mining company, has been increasing its presence in China. The Belt and Road Initiative, which aims to strengthen infrastructure, trade, and investment links between China and several other countries, is among the several infrastructure projects that are expected to drive the mining equipment market in the Asia Oceania region. In India, 30 new coal mining sites have been identified by the Central Mine Planning and Design Institute (CMPDI). These sites are projected to add 100 million ton to India’s coal output. The mining equipment market is consolidated and dominated by a few global players. The key players in the market are Caterpillar (US), Komatsu (Japan), Volvo Construction Equipment (Sweden), Doosan Infracore (South Korea), and Sandvik (Sweden). The industry has adopted key strategies such as expansions, new product developments, and partnerships. For instance, Liebherr decided to expand its Newport, Virginia facility, which is expected to be completed by 2020 and will contain Liebherr USA’s new headquarters and administrative building, a production and workshop facility, and a warehouse and distribution building. The company also has setup a new facility in Rognac, France, with a total area of 43,000 square meters to provide sales, rental, and servicing of earthmoving, material handling, and construction machines. In March 2018, Volvo Construction decided to use 3D printing to quickly and efficiently provide spare parts to the consumers. This is expected to help the company support its consumers throughout the life cycle of its equipment. In March 2018, Liebherr established a new facility in Rognac, France. The facility has a total area of 43,000 square meters. It provides sales, rental, and servicing of earthmoving, material handling, and construction machines. Which equipment category is going to dominate in the future? How are the industry players addressing the challenge of maintaining a balance between performance and low-cost mining equipment? When is electric equipment going to get mass adoption in the mining equipment market and with which mining equipment type? What could be the market size of autonomous mining equipment? What are the key strategies adopted by the players? Which new advancements are the game changers? The study involves 4 main activities in estimating the current size of the mining equipment market. Exhaustive secondary research was done to collect information on the market for mining equipment like crushing, pulverizing, screening equipment, surface mining equipment, drills & breakers, underground mining equipment and mineral processing equipment. The next step was to validate these findings, assumptions, and market analysis with industry experts across value chains through primary research. Bottom-up and top town approaches were employed to estimate the complete market size for different segments considered under this study. The secondary sources referred for this research study include reports on the mining industry, corporate filings (such as annual reports, investor presentations, and financial statements), and trade, business, and mining associations. The secondary data has been collected and analyzed to arrive at the overall market size, which has been further validated through primary research. Some of the key secondary sources used are, Association of Equipment Manufacturers (AEM), Japan Mining Industry Association (JMIA), Euromines (European Metals and Minerals Mining Association), National Mining Association (NMA), and Association of German Mining Equipment Suppliers among others. Extensive primary research has been conducted after acquiring an understanding of the mining equipment market scenario through secondary research. Several primary interviews have been conducted with market experts from both the demand- and supply-side players across 4 major regions, namely, North America, Europe, Asia Oceania, and the Rest of the World (Latin America and Africa). Primary data has been collected through questionnaires, emails, and telephonic interviews. In the canvassing of primaries, we have strived to cover various departments within organizations, such as sales, operations, and administration, to provide a holistic viewpoint in our report. The bottom-up approach has been used to estimate and validate the size of the global market. The market size, by volume, of the mining equipment market has been derived by identifying the country-wise utilization rate or usage pattern of mining equipment based on application—mineral, metal, and coal in the mining industries. This has been further categorized by specific equipment used in the mining industry. The number of equipment units sold in each country, which is derived by referring to company publications, is added to derive the regional market size, in terms of volume. Additionally, the country-level mining association has been considered to derive the market. The market size, by value, has been arrived at by multiplying the average selling price of mining equipment by the number of units. The country-level data is added to obtain the total market size, in terms of value, in that region. All percentage shares, splits, and breakdowns have been determined using secondary sources and verified through primary sources. All parameters that are said to affect the markets covered in this research study have been accounted for, viewed in extensive detail, verified through primary research, and analyzed to get the final quantitative and qualitative data. The data has been consolidated, enhanced with detailed inputs and analysis from MarketsandMarkets, and presented in this report. The following figure is an illustrative representation of the overall market size estimation process employed for the purpose of this study. Caterpillar (US), Volvo (Sweden), Komatsu (Japan), Sandvik (Sweden), and Libherr (Switzerland) among others with a total of 22 companies covered. This research report categorizes the exhaust system market based on equipment category, by propulsion, by electrical mining equipment, by autonomous mining equipment, by region, by industry.